Ret. Army Gen. Jack Keane Says He Declined Offer To Be Defense Secretary : The Two-Way Retired four-star general Jack Keane tells NPR that he declined Trump's offer for personal reasons — and that he recommended retired generals James Mattis and David Petraeus for the job. 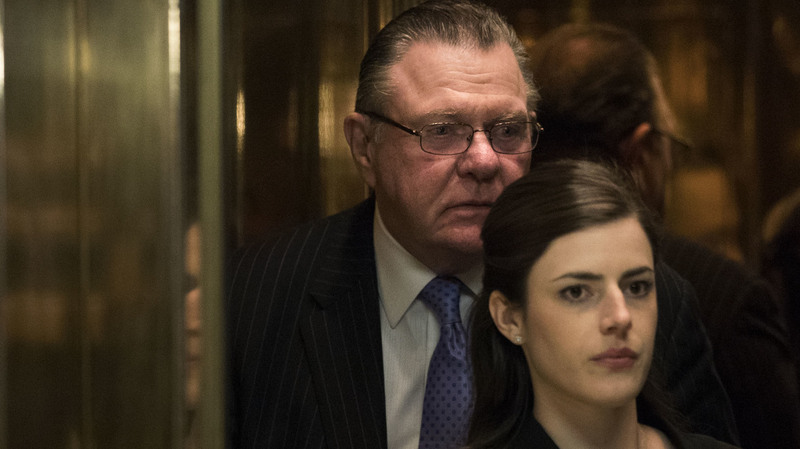 Retired four-star Army Gen. Jack Keane was seen visiting Trump Tower earlier this week; he tells NPR that he declined an offer to become Defense Secretary. President-elect Donald Trump asked him to serve as secretary of defense, retired four-star Army Gen. Jack Keane tells NPR's Rachel Martin — but Keane declined the offer, citing personal reasons. Keane says he recommended retired generals James Mattis and David Petraeus for the job. "I was asked to serve, but I'm not able to," Keane told Rachel. "I have some personal issues surrounding the death of my wife recently, and I explained all that to Mr. Trump, and he was very gracious and understanding, and quite supportive." Keane's wife, Theresa, died in late June after a fight with Parkinson's Disease. The couple were married for 51 years and raised two sons. After saying no to the Defense job, Keane says that Trump asked him who else would be a good fit for the post, he says, and he named retired Marine Corps Gen. Mattis and former CIA Director Petraeus as candidates to lead the Defense Department — and in light of recent reports that portrayed Mattis and Keane as Trump's top choices, Mattis would now seem to be the top pick. Mattis is one of several possible Cabinet office-holders visiting Trump at his golf resort in Bedminster, N.J., this weekend; Keane visited Trump Tower in New York on Thursday. On Sunday morning, Trump said Mattis "was very impressive yesterday. A true General's General!" Trump's other visitors Saturday included Mitt Romney — who is rumored to be in the running for secretary of state — and two possible candidates to lead the Department of Education: former Washington, D.C., schools chief Michelle Rhee and former Michigan GOP chairwoman Betsy DeVos. Today, the incoming president is meeting with more potential appointees and advisers. The list includes: conservative writer John Gray; Kansas Secretary of State Kris Kobach; investor (and rumored Commerce candidate) Wilbur Ross; Gov. Chris Christie; Rudy Giuliani; BET founder Robert Johnson; and investment firm executive David McCormick. On Friday, Trump named his choices to three key jobs in his new administration: Sen. Jeff Sessions for attorney general, Michael Flynn for national security adviser, and Rep. Mike Pompeo for CIA director.